Due to demand overseas for Maine's crustacean, the price of Red's Eats famous lobster roll is at $26.50 this spring. 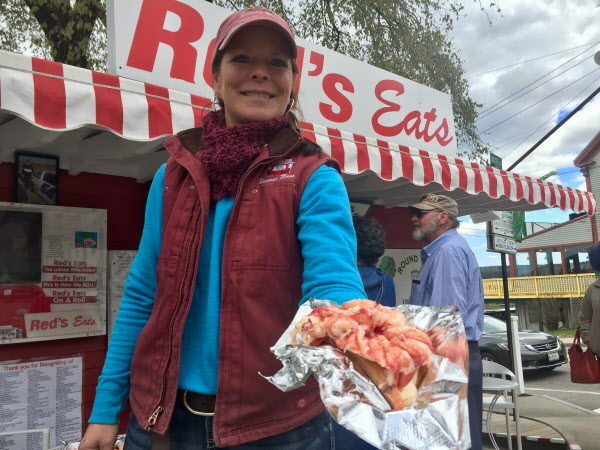 Deborah Gagnon, owner of Red's Eats, greets tourists from Ohio with a lobster roll on Wednesday. Despite paying top dollar for the loaded lobster roll, Tony and Jan Braida say "it's well worth it." 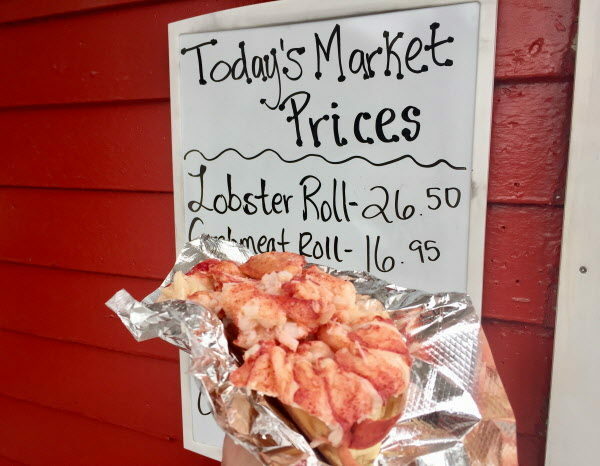 WISCASSET, Maine — The market price for a lobster roll at Red’s Eats is $26.50, the highest it’s been in 79 years. Yet tourists in line at the iconic lobster hut on the Sheepscot River this week didn’t blink. They came for a taste of Maine and were willing to pay for the experience. And they did, handsomely. “The quantity and quality is well worth it,” said Jan Braida polishing off a roll with her husband Tony. The day before, these vacationing Ohioans spent $23.95 on a lobster roll in Kittery and say sampling Maine’s famed sandwich is the reason they are here. The sky-high price of fresh lobster meat this spring sent a jolt through lobster roll purveyors such as Red’s and mobile eatery Bite into Maine in Greater Portland. Deborah Gagnon, owner of Red’s Eats, is paying $45 a pound for fresh lobster meat. Other vendors have been quoted more than $50 for picked knuckles, tails and claws. “When I was opening in April and heard the price, I was like ‘ohhhh, somebody hold me up,’” said Gagnon, whose signature overstuffed rolls deliver more than a typical lobster’s worth of meat. Despite the increase, she’s not prepared to skimp. “No matter how high the lobster price is, I have to have it. Visitors all over the world come here. If we don’t have it, it’s like ‘what the heck?,’” she said. To understand the reasons behind the price spike you have to go back five years, when a glut of lobsters caught in Maine and Atlantic Canada hit the market. Prices plummeted. “Landings in 2012 were big. It was an unprecedented level of supply; something we hadn’t seen before,” said Annie Tselikis, executive director of the Maine Lobster Dealers’ Association. As a result, quick-serve restaurants like Panera started “menuing” lobster, and at the same time the international market exploded as people from Malaysia to Italy developed an insatiable appetite for the crustacean. “That springboards us into an incredible market driven by supply and demand,” she said. Meanwhile, as a new tourist season opens after a cold winter, the supply is tight and there is a lack of fresh caught lobster. Yet desire for lobster, surging from San Francisco to Singapore, has not slowed. “Many people do not understand the incredible global reach of the industry, the investment individual lobster businesses have made to innovate, to market and promote their products abroad,” said Tselikis, who just returned from a seafood expo in Brussels that attracted an international crowd, all lusting for lobbies. In the U.S., Maine constitutes 80 percent of lobster landings. Last year the state landed 130 million pounds of lobsters. Some stay here, but increasingly a great deal are exported abroad. That means family-run businesses like Red’s Eats compete for price, not just with the lobster stand one bridge over, but with their counterparts in China. John Leavitt, a lobster wholesaler from Ready Seafood Co,. a Portland producer and distribution company, says this is the highest he has seen lobster prices in the five years he has been in the industry. Besides demand abroad, a cold spring with chilly water temperatures has kept lobster landings low. Despite selling lobster meat for $40 a pound, he is not losing customers. Far from it. That’s why Bite into Maine, stationed at Cape Elizabeth’s Fort Williams Park, has been so popular. But just as the lobster roll enterprise is expanding with a brick and mortar location in Scarborough, and an Airstream trailer at Allagash Brewing Co. this summer, they are shelling out big bucks for the local delicacy. “The prices are insane. The worst we have seen,” said Bite Into Maine co-owner Sarah Sutton, entering her seventh season. “I wish I had cows and was in the beef business,” she said with a laugh. But for small businesses like Sutton’s, centered on the almighty lobster, price swings are no laughing matter. “We are at the mercy of the market until we get our own lobster boat,” said Sutton, who has been quoted over double what she paid in 2015 for fresh, succulent meat. Last year she had to increase lobster roll prices, and had hoped to hold the line this year, at $17.50. Recent price quotes may change that. 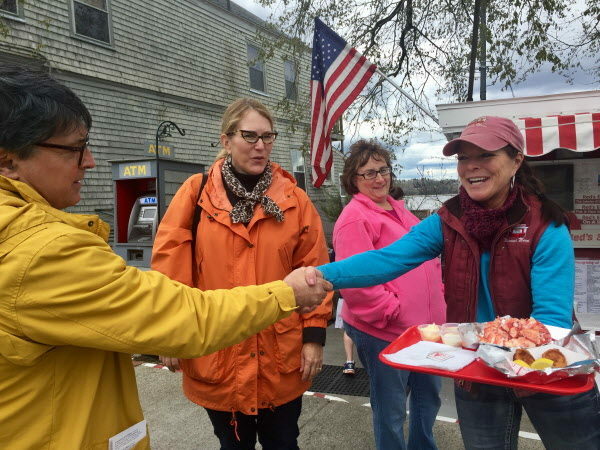 In preparation for Bite into Maine’s opening on May 6 at Portland Head Light, Sutton surveyed lobster meat distributors to find lower wholesale prices. “We may have to open with the price a bit higher than we ended last year, but we haven’t landed on a number,” she said. It’s that taste of Maine that New York residents Claire and Jim Werner waited in line to experience at Red’s Eats Wednesday. It did not disappoint. “It’s a treat,” Claire Werner said. “It’s worth it for something good,” her husband concluded. However, amid the patient queue at Red’s, few locals could be found. “If tourists want to treat themselves that is fine,” said Jorge Pena of Wiscasset, who balked when he heard the price for a roll has reached prime rib levels. You won’t catch him in line this spring.